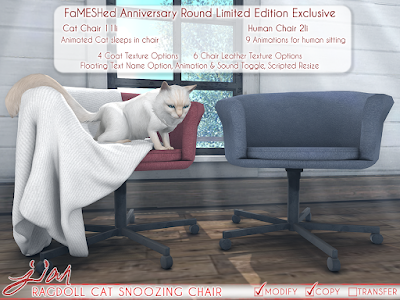 JIAN: Ragdoll Cat Collection & Ragdoll Cat Snoozing Chair @ FaMESHed! Ragdoll Cat Collection & Ragdoll Cat Snoozing Chair @ FaMESHed! Do you like fluffy kitties? We like fluffy kitties. We made more fluffy kitties for you. They're at FaMESHed right now. Get you some. Click post title or below to "Read more" and get the details. With 4 coat textures, floating name text, animation & sound toggle and scripted resize -- the cat collection comes in our standard wanderer and companion varieties. So much kitty. Aw yeah. Chair for you, chair for kitty. The fluffiest co-pilot a body could ask for. Human chair is 2 LI, cat chair is 1 LI with an animated snoozin' kitty to keep you company. Both chairs have 6 texture options.